Does anyone else have an inordinate fear of canning jams or pickling veggies? Every time I read an article espousing the brine-laden wonders of canning your own home-grown vegetables, I think, “how hard could this really be? I can do this!”. And then I hear the niggling voice in the back of my head that whispers, “but what if you get botulism?” And then I mutter in response, “maybe I’ll just buy my own autoclave.” Or not. Thinking about the merits of my own pickled spicy asparagus versus an emergency hospital visit reminded me of a story briefly mentioned several years ago in a Bacterial Pathogenesis class. In our lecture on the spore-forming obligate anaerobe Clostridium botulinum, the organism responsible for the production of the botulism toxin, our professor noted that several cases of botulism in Alaskan Natives occurred as a result of changing methods of fermenting meat. Professor, you had me at “fermenting meat”. Investigating the veracity of this anecdote I found that tried and true Alaskan Native methods of burying meat underground to ferment had been modified by the introduction of Western conveniences. Tupperware containers and sealable plastic bags were now being used to create a meaty, anaerobic environment that C. botulinum was happy to vacation in. Oh plastics, you synthetic polymers, what have you wrought! I also discovered the staggering statistic that Alaska ranks among the highest incidence of foodborne botulism in the world. Indeed, nearly half of all cases of foodborne botulism cases in the United States occur in that icy Northern state; the incidence of botulism in Alaska is 8.46 cases per 100,000 compared to Washington’s paltry 0.43 per 100,000 (1)(9). This is truly a public health dilemma! Botulism has been repeatedly referred to as an endemic “hazard of the North” but typically occurs in western Eskimo coastal villages and Native Americans regions in the southwestern region of Alaska due to their proximity to aquatic foodstuffs (2)(5)(7). As mentioned, C. botulinum is an obligate anaerobe thriving in non-oxygenated environments. It produces endospores, is commonly found in soil and is part of the Clostridium genus, a Gram-positive deathly clan that includes the charming organisms responsible for tetanus, gas gangrene and colitis. The bacterium is infamously known for producing neurotoxins. There are seven antigenically distinct types of botulism toxins and toxin type E, strongly associated with consumption of aquatic animals, is most commonly seen in Alaska (1). All toxins act at cholinergic neuromuscular junctions by blocking the release of acetylcholine causing both muscle and nerve paralysis. Nasty stuff. There is a short 8-20 hour incubation period following consumption of toxin-laden food before the onset of symptoms. Clinical symptoms of foodborne botulism include gastrointestinal, neurological and muscular signs such as nausea, vomiting, diarrhea, dry mouth, blurry vision, dysphagia and symmetrical weakness and paralysis (1). Infection initially starts by the toxin blocking the cranial nerve, leading to a descending paralysis which can ultimately lead to respiratory failure and death. Therapy consists of early administration of antitoxin and supportive care. So, back to this intriguing idea of fermenting one’s meat. The subsistence lifestyle of Alaskan Natives (including the Athabascans and the Aleuts) and Yu’pik Eskimos relies extensively upon hunting animals and fishing, and fermented foods have played a large role in their diet and culture for centuries (8). Such cuisine may include dried or fermented meat of whales and seals, raw muktuk (the skin and blubber layer of whales), and seal oil. Seal oil has been described as “the Eskimo’s salt and pepper”, giving you some idea of the importance of these animals in their diet (3). Fish and fish eggs, typically salmon, may also be used to prepare traditional “stink” foods such as fermented salmon “stink heads” and “stink eggs” to be used as condiments with a cheesy-like texture (3). An Inuit butchering a ringed seal. Image: Science Photo Library. Click for source. “Meat is frequently kept for a considerable length of time and sometimes until it becomes semiputrid. This meat was kept in small underground pits, which the frozen subsoil rendered cold, but not cold enough to prevent the bluish fungus growth which completely covered the carcasses of the animals and the walls of the storerooms”. The customary preparation process has since been modified from fermenting food in a buried clay pit, enclosed in a woven basket or sewn seal skin (known as a “poke”) for weeks or months at a time. Food is now stored in airtight, Western consumer goods such as plastic or glass jars, sealable plastic bags or even plastic buckets, and eaten shortly after in a week or month. Additionally, the food many be stored indoors, above ground or in the sun at milder, less optimal temperatures. This move towards storing meat in warmer, anaerobic settings for shorter lengths of time may expedite the fermentation process and, subsequently, enhance the risk of botulinum toxin production (5). Since epidemiological surveys started in the early 1950s, there was a clear and positive trend in the number of botulism cases coincident with the declaration of Alaska statehood in 1958 and the introduction of Western culture and consumer goods (1)(2)(5)(9). These figures reached their peak in the mid-1990s and have since been declining, a trend attributed to changing cultural tastes of younger generations. An interesting epidemiological point about these outbreaks should be mentioned. It’s uncommon for one person to fall ill to botulism poisoning due to the cultural practice of sharing food (3). It’s not just the introduction of novel fermenting materials responsible for these outbreaks but also the loss of indigenous knowledge regarding preservation techniques. Shaffer et al described an outbreak of botulism caused by fermented salmon fish heads in 1985. The food preparer “had been taught to ferment foods by her mother, but had not prepared such foods in many years”. Instead of placing the wooden barrel in the ground, she left the barrel above ground exposed to the sun. The researchers noted that she retrospectively “recalled having been warned as a child that the sun’s rays had a “death meaning” and that fermented foods needed to be kept away from the “killing rays of the sun”(5). Fermenting food is a delicate, complex process. As the Eskimo scholar Zona Spray notes, every step of the complex preparation process is carefully executed to ensure a highly acidic environment (3). She mentions that usually elders prepare such traditional foods and are better versed in the “oral history of health and sickness” than the younger generations. This strongly suggests that a failure to transmit traditional knowledge and customs may play an pivotal role in the use of different preservation materials and in skyrocketing incidences of botulism outbreaks in Alaska over the past 50 years (2)(5). If you’re interested, there’s a quite grisly catalog by Dolman detailing botulinum deaths as a result of these improper storage practices; most cases seem to be variations on the theme of, for instance, eating rotted seal flipper in a gasoline barrel stored behind the stove. Death meaning, indeed! Skinned seal flippers ready to be fermented. Note the plastic rubbish bin bag. Image: NativeTech. This loss of wisdom in classical cooking knowledge is compounded by the introduction of novel gastronomical delights. Since the 1960s, fermented beaver paw and tail have recently contributed to the menu in Southwestern Alaska (6)(5). Beaver has been customarily boiled in stews but the fermentation of this critter’s extremities is an innovation. This nontraditional food item has since been incriminated in several botulism outbreaks. In 2001, 14 people fell ill after eating beaver tail and paw that had been fermented in a closed paper rice sack and stored for three months in a patient’s house (6). Some of the meat hadn’t fermented for very long, only being added to the sack within a week of its consumption. This change in dietetic patterns of species that may as less amenable to the fermentation process than other customarily used meats also play a role in some of the more recent botulism outbreaks. So how do these C. botulinum spores find their way into my stink eggs and seal oil, you may ask? A number of studies have found high numbers of these unusually hardy spores along the soil and off-shore waters in the Alaskan coast; these spores are quite resistant to the low temperatures of the North and can survive for months at a time (7)(4). It is speculated that freshly caught fish and sea mammals butchered on beaches may be contaminated by soil thereby introducing the bacterium to food destined for fermentation (4). This is apparently a common practice in Eskimo camps, where the carcasses of seals are piled on beach shores for days prior to being skinned and prepared for consumption (7). It is also been hypothesized that marine mammals and fish inadvertently ingest these spores during feeding ultimately contributing to their intestinal flora; such “endogenous infection” may also serve as an origin of contaminated meat (7). An Inuit dipping dried fish into a container of fermented seal oil. Image: Dr. John Tyman. Source: Pitt Rivers Museum at the University of Oxford. Click for source. One may ask, why not just cook the meat to kill the spores and heat-labile toxin? And, in fact, both the spores and type E toxin are susceptible to high heats of 80? for a short period of time. The possible response to such a suggestion is succinctly put by Dolman, “the violation of time-honored recipes may be rejected because the desired flavor will be lost; it may be scored in defiance of the white man’s encroachments and paternalism; or ignored when fuel is scarce, time short and hunger rampant” (7). Botulism poses a unique and recurring public health threat to Alaskan natives due to a pretty neat triumvirate of ecological, dietetic and cultural factors that enhance the risk of infection. Modernized native life-styles and loss of indigenous knowledge have clearly affected traditional methods of preparation and preservation practices but it’s important to keep in mind that fatal botulism outbreaks aren’t a novel phenomenon strictly related to changing fermentation practices. There are several instances of Alaskan Natives contracting the illness following consumption of the raw meat of long since deceased beached whales. In fact, whalers and arctic explorers in the late 1890s and early 1900s describe entire Alaskan families dropping dead following consumption of semi-decayed whale meat (2)(7). This is a dietary choice and culinary practice long informed by culture and history which, in turn, is designated by some pretty profound ecological and climatic circumstances. I’m afraid that this article doesn’t speak to the social and emotional ramifications of botulism infection nor does it consider the consequences of the loss of indigenous culinary practices to its younger generations. But think about it, would you? Botulism is a rare disease and it’s fascinating to find this niche where a preventable disease makes a strong appearance in the population due to cultural practices. For more information not mentioned here on Alaskan Natives, their diet and botulism, please visit the links below. In the meantime, I’ll spend more time contemplating whether to purchase an autoclave off Amazon. There is a phenomenal article in Gastronimica: The Journal of Food and Culture that details the culinary history and practices of Alaskan Eskimos by the Eskimo scholar Zona Spray. It’s a wonderful read in itself but really goes into the nitty gritty of the “subsistence” diet of Eskimos if you’re interested. Click here for the Jstor link. 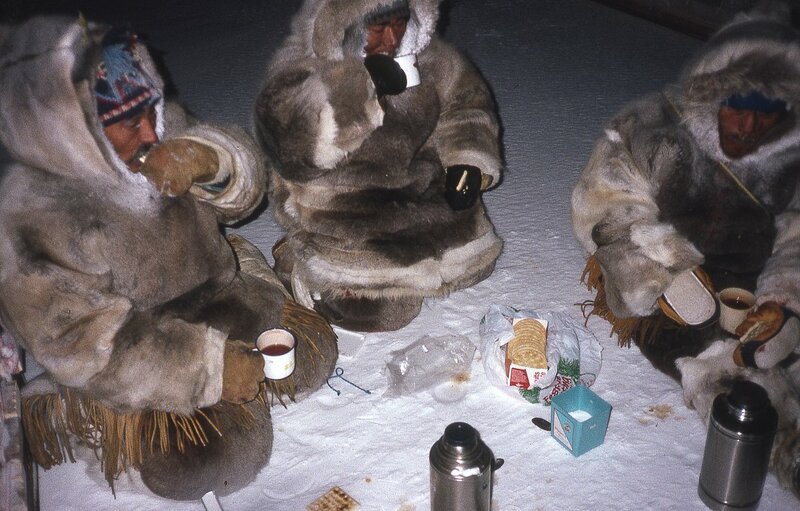 The geographer John Tyman lived with an Inuit family for several months and did a great job of photographing their culture, lifestyle and food habits. I highly recommend visiting his archives! For the sake of brevity, I’ve excluded a lot of molecular and microbiological data about C. botulinum. If you like that stuff, go to this great review of the organism and the different types of botulism diseases (foodborne, wound, inhalational, etc) it’s capable of causing. To learn more about the clinical aspects of botulism, I highly recommend the guide “Botulism in Alaska: a guide for physicians and health care providers”. It’s a great resource and provides far more information that I wanted to include here but, again, brevity. You can snag the pdf here. (2) Botulism in Alaska. A guide for physicians and healthcare providers. 2005 update. State of Alaska. Department of Health & Social Services, Division of Public Health, Section of Epidemiology. What a great article! I love your blog. You have a great way of making a gross subject interesting. Please keep it up. Why on Earth would you even consider buying an autoclave that has no reviews?